Another updated deck from Palm has arrived, the Enduro. 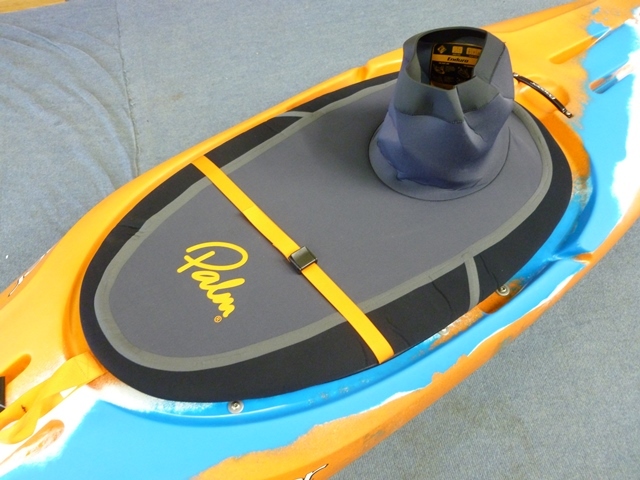 This is a great midrange neoprene deck which will be suitable for a little bit of everything from Whitewater, Playboating and even a little bit of Sea Touring. 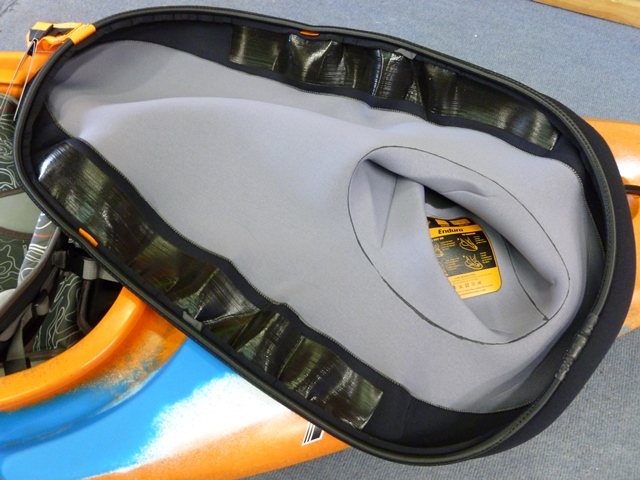 Available in either R4 (Keyhole) or R5 (Bigdeck) with four different waist sizes, for the price the Enduro really offers a lot of great features and we have been pretty impressed. 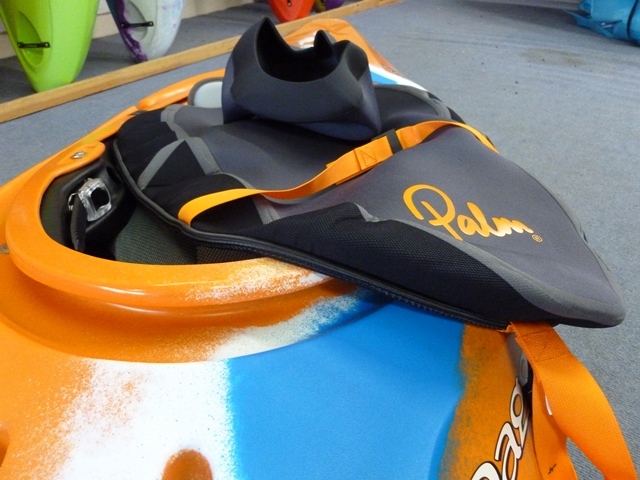 The main features of the Enduro Deck include a great 3d shape, a reinforced Supratex Nylon outer edge, sticky Gripsil coating on the underside, a bright orange knee strap and an ‘O ring’ waist tunnel. 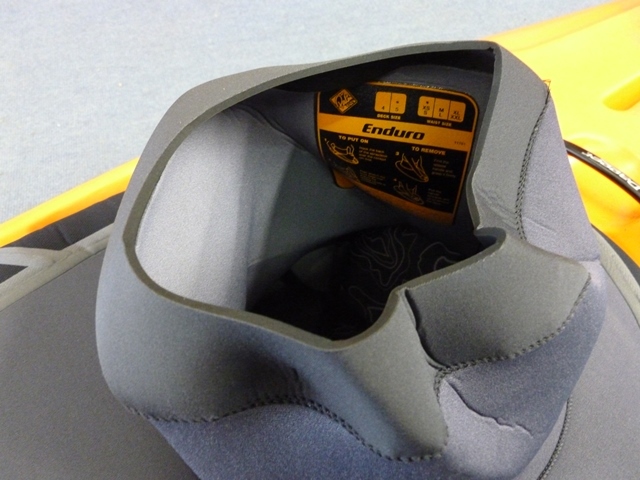 The Enduro is made in three parts from really good quality neoprene. 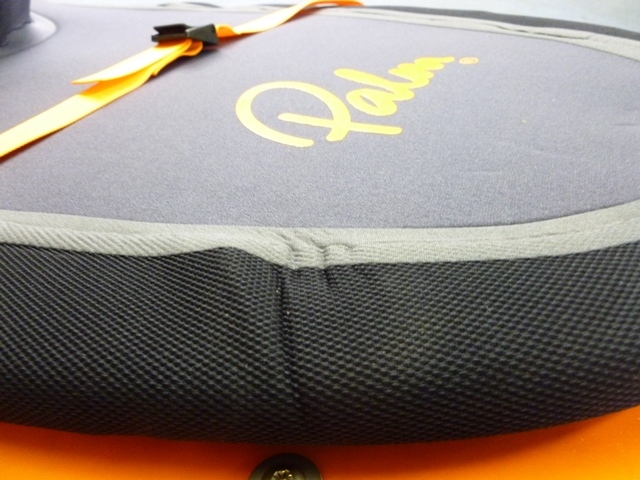 A flat deck area is triple glued and blind stitched to a pre-shaped reinforced Supratex rim and the O-ring waist tunnel. On the outer face of the deck all the seams have been taped as well. Making the deck and edge separately Palm have cleverly managed to get a really good shape to the deck which mirrors the cockpit on the boat giving a great fit. Its very noticeable especially at the front edge of the deck with the shock cord nipping or folding back under the deck as shown below. The Supratex edging is a tightly woven Nylon fabric face material that give the deck some protection while not making the deck too hard to get on and off due to the flexibility and slight elasticity. It runs around the edge of the whole deck. Two sticky Gripsil stripes on the underside of the deck help hold it in place and create a better seal to keep water out. The bright Orange knee strap with quick release gives you another option when you want to get the deck off quickly. Finally the one piece O-ring at the top of the waist tube help keep the tunnel in place and creates a bit of seal against the layer underneath. The inside of the O-ring is finished with a grippy rubbery coating. Previous Hou Canoes Prospector has arrived!